If you’re like me you probably ate one (or two…) too many cookies over the past few months, and maybe you’re trying to make up for it by eating a little bit healthier. 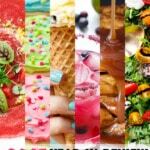 I won’t call it a resolution (I don’t do resolutions) but rather a fresh start and a chance to get some fresh new recipes in the repertoire (quick/easy/healthy being the key words here). At least, we’ll try our best for the next few weeks until we all cave and dive head first into the chocolate stash. Hey, it’s the thought that counts, right? Sushi is always one of those things that feels like a treat but is actually surprisingly healthy. It’s my go-to when I want to go out to eat but can’t stomach something overly rich and heavy. Unfortunately for those looking to cook more at home, sushi isn’t exactly the easiest thing to prepare (although it is quite fun if you’ve got some time to spare and/or a few extra pairs of hands to help you). 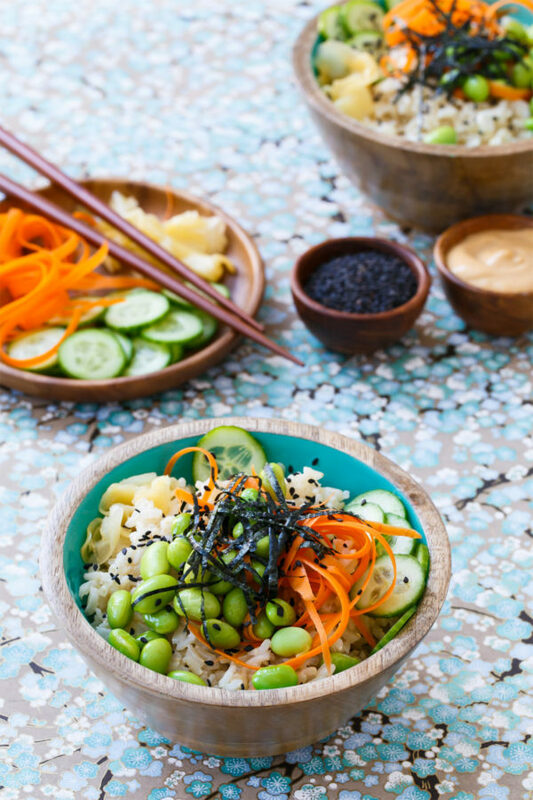 Which is why this sushi bowl is so brilliant – it’s got all the varied flavors of sushi that you love so much piled into a bowl instead of assembled into a finicky roll. 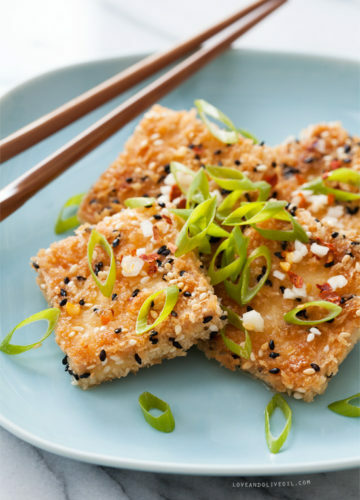 We kept this version vegetarian, but you could certainly add some sushi-grade fish if you were so inclined (and if such high-quality seafood was available to you). Basically, imagine your favorite sushi roll in your mind, deconstruct the parts, and pile it in a bowl on top of a bed of rice. 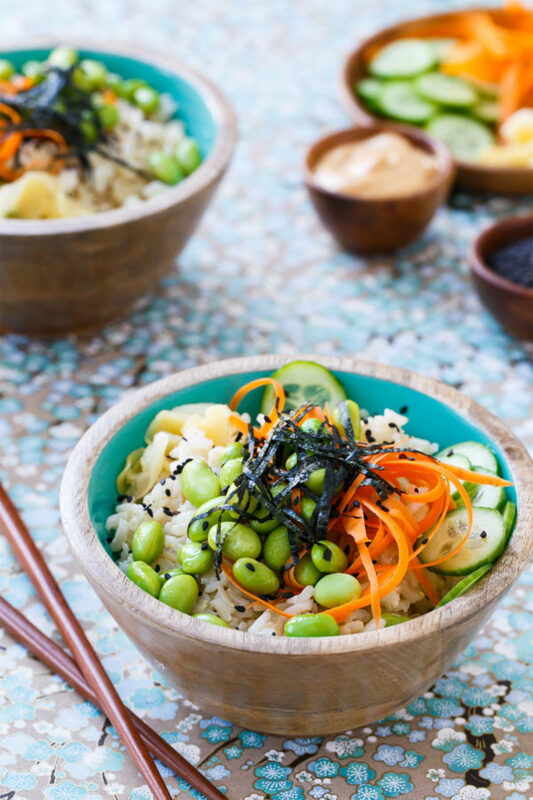 We made our bowls with brown rice, both to add to the look-at-me-being-all-healthy mentality, but also to add some extra heartiness to the dish since there is no meat (and for a vegetarian dish, let me say it’s surprisingly filling). 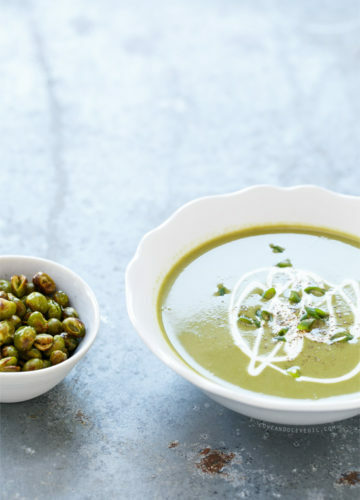 The protein-packed edamame doesn’t hurt, either. The sauce is a spicy mayo-like concoction not unlike what you’d find atop many classic sushi rolls. 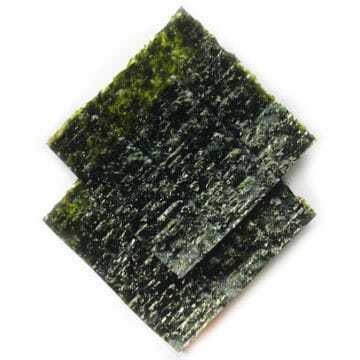 And because sushi wouldn’t be sushi without the seaweed, we incorporated that distinctive briny flavor by thinly slicing up a sheet of sushi nori and treating it like sprinkles on top of this perfectly balanced bowl. Eating healthier would be so much easier if everything tasted as good as this. 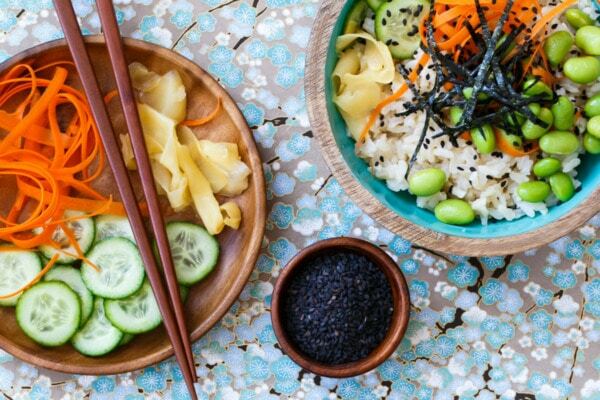 Your favorite vegetarian sushi roll deconstructed and served in a bowl. Healthy, hearty, and satisfying! 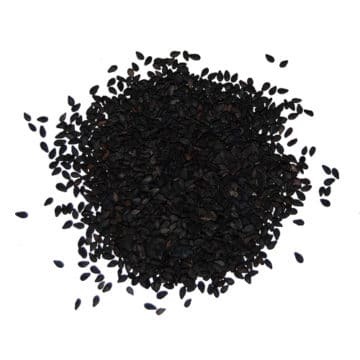 Bring rice and 2 cups water to a boil in a saucepan set over medium-high heat. Reduce heat to medium-low, cover and simmer until liquid is absorbed and rice is tender, about 40 minutes (refer to package for specific cook times). Remove from let sit, still covered, for 10 minutes, then spread out onto a cookie sheet or casserole dish to cool (rice can be made ahead of time). 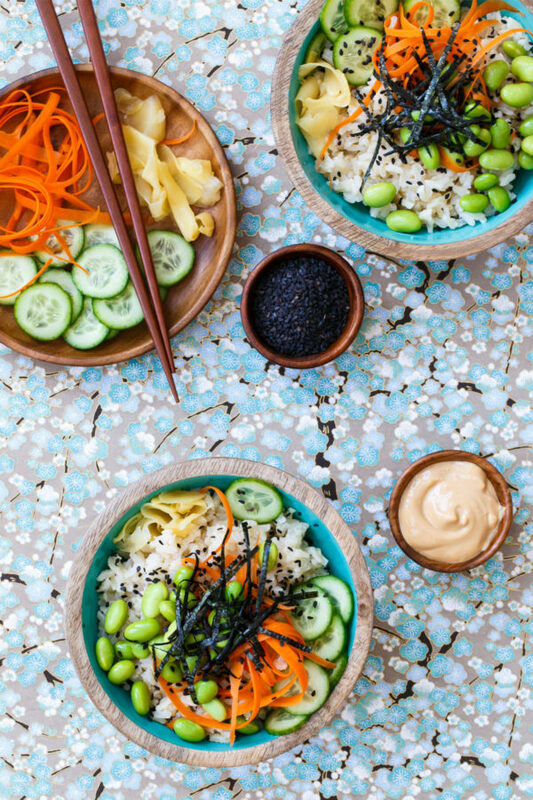 In a small bowl, whisk together mayonnaise, garlic, rice vinegar, sriracha, and soy sauce. Add more sriracha to taste if you want a spicier sauce. The sauce will be fairly thick. If you like you can thin it out with 1-2 tablespoons of water for a more ‘drizzling’ consistency. Bring a small pot of water to a boil. 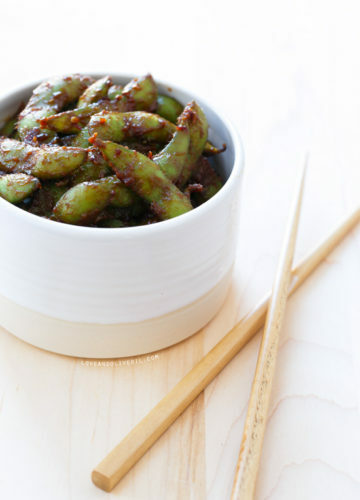 Cook shelled edamame for 3 to 5 minutes or until tender but not mushy (again refer to package for specific cooking instructions). Drain and rinse with cool water to stop the cooking process. To assemble, divide rice among serving bowls. 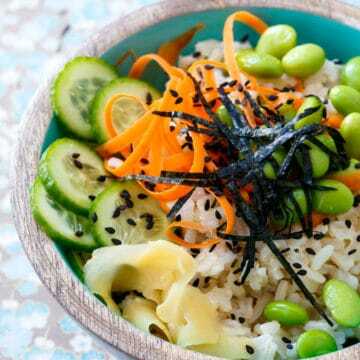 Top with edamame, carrot, cucumber, and seaweed, plus a few slices of pickled ginger and a sprinkle of black sesame seeds as a finishing touch. Drizzle with sauce and serve at room temperature. Yay, I love sushi so much, and something about eating it in bowl form seems like it would make me love it even more! This looks so fresh and delicious! 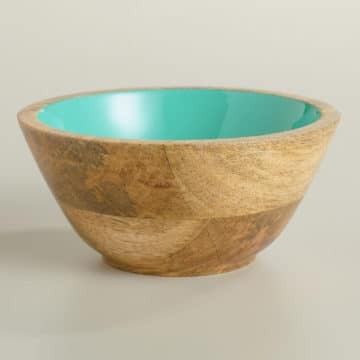 What a great take on the ‘bowl’ concept! I’m wishing I hadn’t already grocery shopped this week, since I’d love to add this to my menu. Next week for sure! These sushi bowls looks so delicious!! I love that spicy sauce. Yum! I’ve had the biggest sushi craving lately! I should make this for lunch one day this week! What a great idea! These look so delicious! Perfect for post-holiday detox. I love sushi bowls! This looks great. This is SWEET! 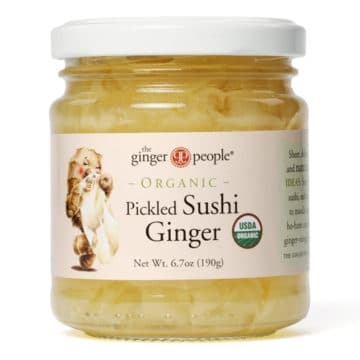 I’m not a fan of sushi myself, but I will definitely share this with my sushi-loving friends! i’m imagining all sorts of things- teriyaki unagi/eel with avocado and cucumber, salmon poke with pickled ginger, ribbons of tamagoyaki with plenty of veggies…. Such a good idea! I definitely can’t get my act together enough for real sushi, but I think even I can make some rice on a weeknight. Yum! I love sushi but I’ve always been intimidated to make it at home but this recipe has all the delicious elements of it! Also, I definitely ate more than two cookies…. 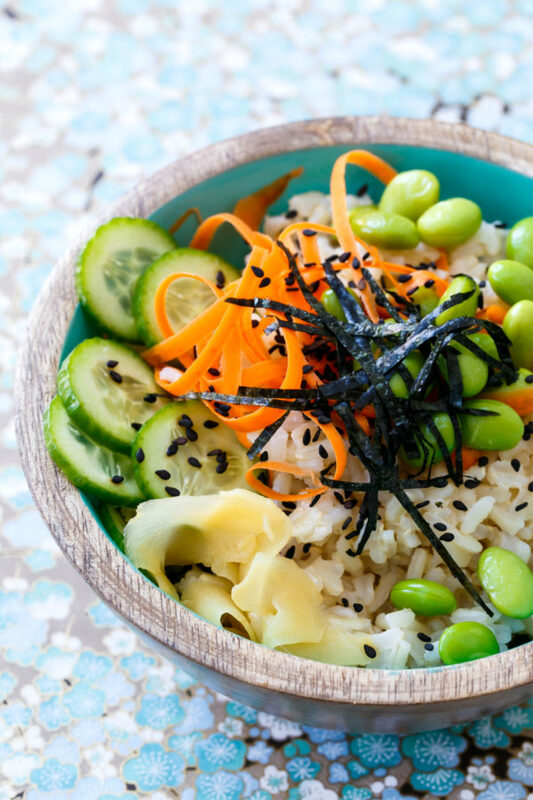 I love sushi bowls! Yum! This is absolutely genius! I love that you made sushi easily accessible at home. I am not a fan of fish but my fiancee is. 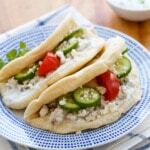 This recipe sounds delicious and I love how I can skip on the fish but add some for him. I often make these for work lunch, with canned or smoked salmon in addition to the veggies. Cooked sweet potato and avocado are also great additions!